The no holds barred, sci-fi fighting franchise is reborn on the Nintendo DS. 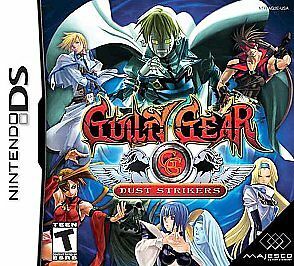 Guilty Gear Dust Strikers features all 21 Guilty Gear characters from previous versions in a battle that takes place on multiple levels across both DS screens. Navigate different types of floors and traps as you battle against the computer or via wireless multi-player connections. Includes all 21 Guilty Hear X2 #Reload characters, including SolBadguy, Potemkin, May, Dizzy and others. 6 Modes of play including Arcade, Story, VS Battle and mini games. Customizable Robo-Ky character with various move set in RK-Factory Mode. Intertwining stories between single player campaigns reveal never before known insights into each character's personality and past. Use Swap, Tension Max, Freeze and Thunder items to damage an opponent's health during gameplay. 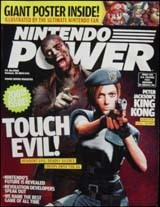 Includes franchise favorite moves like Psych Burst, Dust Attack and Roman Cancel. 4-player wireless versus matches where the last person standing wins.